Dairy farmers have been told ‘milk prices should recover by summer 2015’. Such was one headline about the comments of Farming Minister George Eustice, following a House of Commons Welsh Affairs Committee meeting. He was, he said, ‘confident of a swift recovery for the dairy sector in Wales and across the UK’. The best way to describe the statement would be optimistic, given summer is just three months – and a huge flush – away, and markets are lacklustre. Prices may improve, but only slightly. But to recover? That is a long way off. What is needed for a recovery is a quantum leap in market factors, both here and on the world market. And there are no signs of this happening just yet. However, it is not all doom and gloom as there are positive signs and some buyers are holding prices. There are even positive improvements in prices in the Netherlands, with Friesland Campina increasing by €2.5/100kg to €34. It looks like a handsome increase, but we have to bear in mind its price is based on 4.41 per cent fat, 3.47 per cent protein, 4.51 per cent lactose, and paid in a ratio of 10:5:1 (protein, fat and lactose), with prices applicable to 600,000kg of milk. UK standard litre prices are based on 4 per cent fat and 3.3 per cent protein, for 1 million litres. Friesland does very well selling lactose and is not hampered by currency exchange rates which are giving UK milk prices a thumping at the moment. This chart takes the EU butter price since January 2010 and plots the UK equivalent price using actual exchange rates and also the price using the average over the period, which was €1.19. Using that average rate, the current Dutch price of €3,420 converts to a UK price of £2,873; but at the present €1.41 rate, it converts to £2,425 – a difference of nearly £450. If we take cheese, the current EU mild cheddar price is €3,290, which at the current exchange rate of €1.41 equates to £2,325. At the €1.19 exchange rate, it would equate to £2,760 – a difference of more than £400. 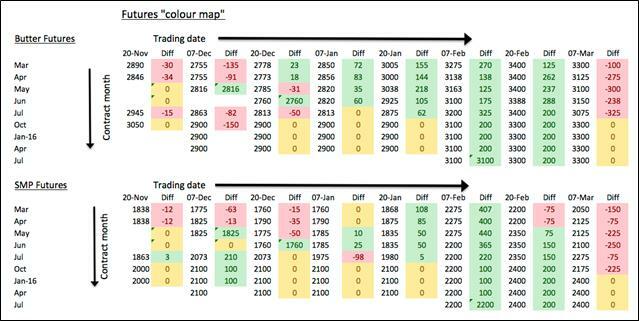 Price and currency movements in the last two or three weeks alone have knocked well more than 1ppl off milk prices, for example. Arla farmers, with a degree of protection via their currency smoothly mechanism, would have their price eroded by about 0.5ppl, probably. And with currency keeping prices pegged back, there does not seem to be much market support either. While butter is holding its own at the moment, with EU prices static for three weeks, skimmed milk powder prices have dipped again after six weeks of continuous increases since the start of 2015. The Global Dairy Trade, which governs trader sentiment, has posted six consecutive increases on the back of lower volumes and drought concerns, but those worries are easing with the arrival of some rain. Fonterra is releasing more whole milk powder onto the auction as a result, so watch prices slip back accordingly. The fact is traders are not worried about product supply at all and it is concern over this which drives the market. The reason they are not worried is simple: they know there will be plenty of product available from the first EU quota-free flush. They are right too. Whichever way you look at it, we are not going to be short of milk over summer. Futures markets are echoing this sentiment in hard economic terms as well. The Government is saying prices will ‘recover by the summer’, while futures are saying they will not. In fact, if we take those prices and convert them into a farmgate price it comes to an AMPE price of just 22ppl before haulage, and less than 20ppl afterwards. Therefore, milk prices would need to be significantly higher than AMPE to return break-even prices. Currently, the Defra farmgate price is tracking 6-7ppl higher than AMPE, but only because aligned contracts will be skewing figures by a significant degree. Prices will not improve until global demand is back in line with supply. On the demand side, this largely means China filling its trolley with dairy products again and Russia opening its doors for EU imports. Currently, neither looks likely, although China will surprise us first. On the domestic front, an increase in the amount of money injected in the dairy supply chain at consumer level would help enormously, but with food deflation being par for the course and retailers slugging it out with bargain basement prices, this is not going to happen either. Thus we are left with supply, and we are going to have loads of milk for the next few months with the previously quota-constrained Germans, Irish, Dutch, Danes and others having had their shackles removed. Hopefully, the EU can continue to export the additional milk on the back of the weak euro against the dollar, but when the market will recover is a hard one to call. We will be able to assess more after the flush is over, but for now the best hopes are for modest price progress over summer and autumn. The several pence per litre recovery which is required does not look as if it will come until next year. The headlines from Mr Eustice’s comments are far too premature.